OSIM SUMMARY: This case report details two instances in which patients presented with a displacement of the trachea due to a neck mass and required ventilation. 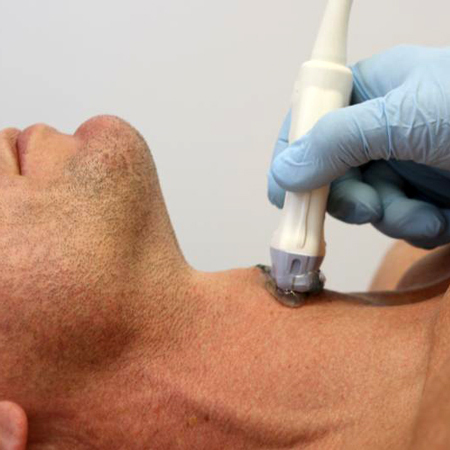 Ultrasound (US) was used to guide successful percutaneous dilatational tracheostomies in both cases. The report asserts that US use in airway management can reveal malformations and predictors of difficult airways, thereby diminishing risks and circumventing complications. The report acknowledges that there is a lack of literature regarding US-guided percutaneous dilatational tracheostomies but concludes by advocating for the use of US before, during, and after the procedure to improve patient outcomes. Valencia JA, Romero DJ, Arango E, et al. Ultrasound-guided percutaneous dilatational tracheostomies in 2 difficult airways. J Ultrasound Med. 2018 Apr;37(4):1043-1048. Ultrasound has become a rapid, safe, and easy-to-use tool for anesthesiologists. It reduces complications, morbidity, and mortality, especially in patients with anatomic abnormalities in whom a traditional approach may be both difficult and risky. We report two cases of symptomatic patients with a difficult airway due to displacement of the trachea by a neck mass. Real-time ultrasound imaging was performed for percutaneous dilatational tracheostomies, identifying important structures, without any complications.